Harlem, NEW YORK—Seven candidates looking to succeed Mayor Bloomberg squared off Thursday, Feb. 28 at the First Corinthian Baptist Church to discuss poverty- related policy issues. The discussion took some surprising turns. 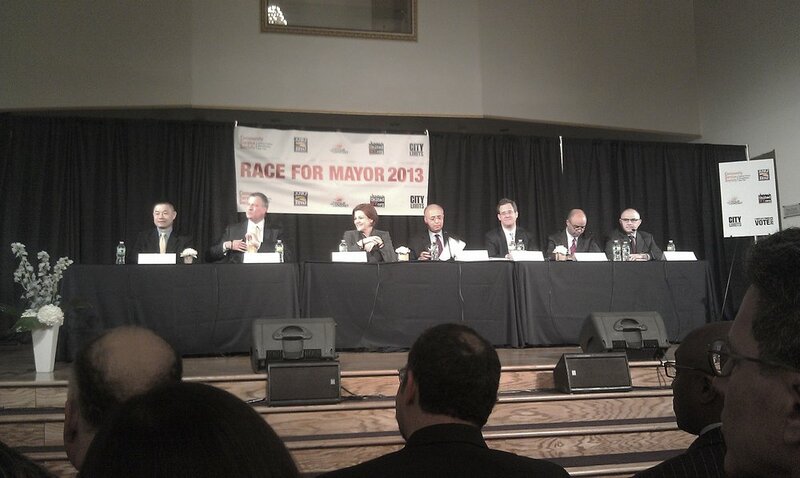 Democrats John Liu, Bill de Blasio, Christine Quinn and Bill Thompson argued for a progressive approach to New York’s future, while Tom Allon and Adolfo Carrion Jr. pitched a moderately conservative approach to remedy the city’s issues. Sal Albanese, a former city councilman, arrived on an independent mantle, rooting his message in his past work in the council chambers. Hector Gomez, a car washer in the city, voiced his concern over unfair pay practices, which led to a larger question over the accountability of businesses in the city--and De Blasio’s response: “Hasta la victoria siempre ('onward to victory'),” echoing communist Che Guevara’s farewell to Cuba. De Blasio’s solution for unfair business practice called for cancellations of any city contracts said businesses have. Quinn’s solution, by contrast, included holding hearings and refining legislation. The forum, organized by the Community Services Society, drew hundreds of people seeking answers to the city’s woes. The attendance in the crowds included a faction of the local unions, SEIU 32BJ, and various community defense groups, such as the Center for Popular Democracy and United New York. First Corinthian Church’s Pastor, Michael Walrond Jr., delivered a fiery introduction to the night's theme of poverty. In his tale, he described New York, divided into “two cities.” “There is a tremendous inequality in the city,” Walrond Jr. said. Pastor Walrond Jr. explained how the two cities--one for the rich, and a larger one for the poor--present a clear, urgent problem for New Yorkers. He said that people are being “priced-out of Harlem,” and questioned how New York could continue in this contradiction between rich and poor. “No matter how wealthy New York City may be, it is an impoverished community,” Walrond Jr. said. Brian Lehrer, radio talk show host at WNYC , and the forum’s moderator, turned Walrond’s charges over to the candidates to address. Living wage legislation and mandatory sick pay took the throne as proposed saviors of the lower classes. Each candidate supported President Obama’s calls for a nine-dollars-an-hour minimum wage. De Blasio called for action from the city council on “real living wage legislation,” proposing that they “give us [New Yorkers] legislation on sick days.” He called for more government intervention during trying times, citing the legislation of President Franklin D. Roosevelt and former New York Mayor Fiorello La Guardia as examples. Carrion believes the key to helping people out of poverty is small business, noting a shift must be made away from the “F.I.R.E. economy,” which is composed of excessive support of the financial, insurance and real estate sectors. Allon, voiced support for Carrion’s observations, noting Bloomberg failed small businesses during his tenure. Lehrer transitioned to campaign finance for the next issue, after Albanese called out De Blasio’s willingness to vilify large businesses, while simultaneously collecting donations from them. Quinn noted that she led reforms on campaign finance in 2007.